In a word: no! So what is the relentless campaign against Corbyn’s ‘antisemitism’ and ‘terrorist wreath-laying’ in our national media all about? Our ruling class is not totally stupid, so if it’s mounting a campaign you can be sure it has some real end-goal in mind. But the truth is that it has nothing whatever to do with antisemitism, which is a complete smokescreen. The Tories, the mainstream media chorus, along with many Labour party figures such as Jo Ryan and Margaret Hodge, have two goals in mind. First they seek to discredit Corbyn’s ‘left-wing’ credentials, damaging the source of his credibility. 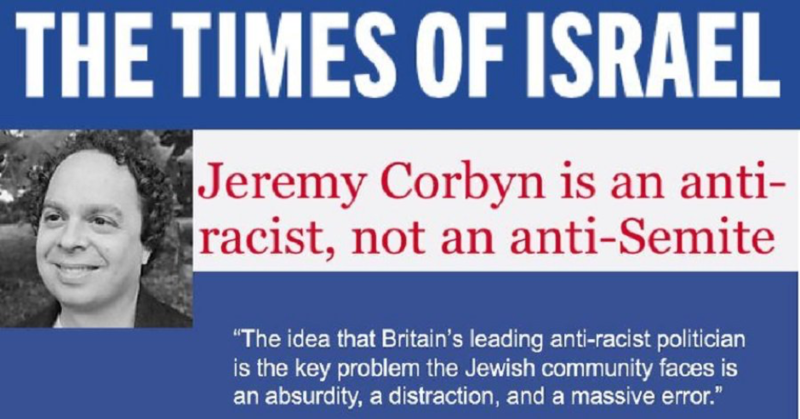 Accusing Corbyn of racism when he is patently not a racist (being a longstanding anti-apartheid, Irish republican and pro-Palestine campaigner) is ludicrous. Corbyn is certainly less racist than any previous leader in Labour’s history. But throw enough mud and some is bound to stick – and perhaps the rug can be pulled from under the Labour ‘left wing’, which has proven to be far more electorally challenging than either the Tories or Blairites had dreamed. So it’s break or make: break Corbyn, or make him fully compliant to the needs of British capital. His agenda must be beaten back onto mainstream imperialist lines on every front, just in case he graduates from leading the opposition to leading the government. The relentless mass-media circus continues, ensuring Corbyn compliance and advancing from point to point: protecting the City bankers, preserving an austerity budget, keeping NHS privatisation on course, backing down on student loans, keeping Trident, hyping the trade war with China, backing down from defending the revolution in Venezuela, and preserving British imperialism’s grip on the middle east. 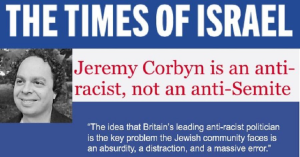 Second and most crucially, the ‘antisemitism’ campaign seeks to shield Israel, and by extension British and US imperialist policy in the Middle East, from all criticism. Israel remains an important vehicle of Nato policy in the Middle East. Israel is an active partner, for example, in the illegal proxy war that the US is waging in Syria, supporting the IS jihadis from the occupied Golan Heights, notably giving the feudal mercenaries medical and logistical support, illegally bombing Damascus, and evacuating the remnants of the White Helmets (the propaganda wing of the IS, who grotesquely pose as ‘medical officers’). That’s why outgoing US president Barack Obama signed a memorandum of understanding in 2016, granting Israel $38bn over 10 years. Of course, the US seeks a return on its investment, and therefore Israel must be protected from any threat – including from the court of world public opinion. Israel legally discriminates against its Arab Palestinian population, using its supremacist ideology and discriminatory law to systematically dispossess Arabs of their land and rights, routinely committing mass murder and ethnic cleansing. Far from pursuing a viable peace process, it is abundantly clear that an Israel at peace with its neighbours is of no value to imperialism. Last year marked the 100th anniversary of the Balfour declaration, with which the British war cabinet of Lloyd George signalled its agreement with Zionism to bring into being the state of Israel. It made plain that this policy was not born of regard for the special oppression of the jews, any more than any other subject or marginalised people. It is historically absurd to rewrite the motives of the largest empire in the world, when it was in the midst of the most bloody war to protect its slaves and colonial possessions, as having any other motive than self-interest. Rather, its purpose was to create a “little loyal Jewish Ulster in a sea of potentially hostile Arabism”, according to Ronald Storrs, Britain’s then military governor of Jerusalem. The words of the British colonial police in Palestine are indicative of the really supremacist culture with which they fostered their colonial project. Douglas Duff had been stationed with the Unionist Black and Tans in Galway before moving to Palestine. Referring to the Palestinians of Haifa, he wrote: “most of us were so infected by the sense of our own superiority over these ‘lesser breeds’ that we scarcely regarded these people as human”. This tradition has been proudly upheld by the Israeli military. The definition of antisemitism is remarkably simple: it’s “hostility to Jews, because they are Jews”. There is no doubt whatsoever that the overwhelming majority of Labour party members, like the British public, are not antisemitic (obviously no mass institution can possibly say it is unaffected by a single member who holds irrational views). 6. any claim of systematic bias in the mainstram media towards Israel. Corbyn and his supporters are being targeted precisely for their historical support of Palestinians and their criticism of Israel. That criticism is arguably far too mild and ineffectual, but nonetheless it is unpalatable to Zionism and imperialism alike. This conflation of Israel and Zionism with Jewishness is not new and is not accidental. It is the stock-in-trade of the aggressive imperialist and Zionist PR machines. They rely on the fact that, with the all-pervasive (and incorrect) ideas of identity politics, ‘no-one has the right to comment on another person, identity or group’s experience’, and that, in modern multicultural Britain, no-one likes to be called a racist (quite rightly), to intimidate opposition. It is not antisemitism, but just outrage at the real crimes committed by the state of Israel that draws opposition from all who look at its policies and actions with any measure of objectivity and impartiality. What is at stake is the right of political criticism of the crimes of imperialism, of imperialist war in the Middle east, and of the key proxies of British and US imperialism, such as Israel. The mainstream narrative is unravelling and this is a rearguard action to subject all independent media to the same censorship and monopoly control as the mainstream print and broadcast media. Demand the protection of freedom of speech and of conscience! Oppose the adoption of the IHRA’s Zionist definition of antisemitism! Oppose the criminalisation of all criticism of Israeli apartheid!